Florida has the third-highest employment numbers for medical assistants and was one of the first states in the nation to offer legislation that clearly defined what a medical assistant is and what they can do. Medical assistants in Florida can provide care that is often outside the scope of MAs in other areas of the country; for instance, medical assistants in Florida can administer medication as directed by a physician and perform dialysis procedures. Get in-depth information about what Florida medical assistants can expect with training, salary and job growth. There’s a great need for quality health care professionals in Florida to help take care of the aging population. A great foot in the door is a career in medical assisting, which requires a degree or certificate. Upon graduation, medical assistants work in a variety of heath care facilities, helping physicians ensure the best quality of care for patients. With the wide range of degree programs available in the state, we started your homework for you, looking at some of the biggest factors that go into a quality program—career counseling, tuition rates, student-to-faculty ratio and the number of programs available. Check out the top medical assisting program for 2017 below. College students interested in pursuing a career as a medical assistant after graduation may be interested in pursuing the associate of science degree in medical assisting offered at City College in Altamonte Springs. This program puts students through comprehensive theoretical and applied learning opportunities that foster skills that are sought-after by employers in the medical field. City College offers many of its courses in a distance format, allowing student workers, students with family obligations, and even out-of-state students to benefit from a City College education. Students may further prepare for future careers by meeting with one of City College’s highly trained career counselors. There are numerous schools and programs for medical assistants in the Sunshine State. To narrow down the options, we provide this handy search tool. Students can search for the certificate or associate degree program that suits their needs and budget. What does Florida consider to be a medical assistant's duties and obligations? Florida statutes define a medical assistant as a skilled professional who is able to assist in medical practices and procedures under a physician's direct supervision and responsibility. 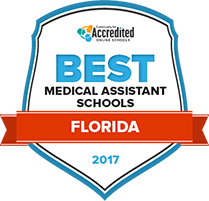 The medical assistant in Florida assists in management of patient care, performs clinical and administrative duties, and may also perform supervisory and managerial functions. The statute states, "Competence in the field also requires that a medical assistant adhere to ethical and legal standards of professional practice, recognize and respond to emergencies, and demonstrate professional characteristics." What are Florida MA certification requirements? Though certification is not expressly required in the state of Florida, medical assistants are encouraged to seek certification, and the state does point out which certifications are recognized. In addition, a competitive job market means that employers will often look for the person with the highest credentials, and having certification can improve the chances of getting hired. Is formal medical assistant education or training required? There is no requirement for education or training for medical assistants in the state of Florida. However, medical assistants are encouraged to become certified. In order to become certified, they must graduate from an approved training program. Are there tasks outside the scope of medical assistants in Florida? Medical assistants in Florida are given a great deal of responsibility, with a list of potential tasks spelled out by statutes. However, nurses and physicians cannot delegate anything to medical assistants that might fall under the auspices of the practice of medicine. For instance, prescribing medication would be outside the scope of medical assistants in most states, including Florida. Medical assistants in Florida tend to make slightly less than the national median wage; however, MAs with more experience and higher credentials might see better pay rates. Here's how the numbers stack up in comparison to the national wage. The salary for a medical assistant in Florida can vary widely from one area to another. The following chart focuses on the wage percentiles for various metropolitan areas, as well as the breakdown of hourly median wage for each area. Medical assistants are in high demand across the country, and Florida is no exception. The rate of employment for medical assistants in the state is expected to be slightly higher than the national average between 2012 and 2022. The following chart offers more details. Florida is home to numerous schools poised to meet the demand for medical assistants. These three spotlight schools illustrate the various opportunities for aspiring students in the Sunshine State. With small classes, students receive optimal support from faculty. The final semester consists of hands-on training in local healthcare facilities. The medical assisting vocational certificate takes 10 months to complete and is comprised of classroom, laboratory and real-world instruction. Classes are taught by those who practiced as certified medical assistants. The medical assisting program prepares graduates for a career in a wide variety of healthcare realms, including hospitals, blood labs, doctor's offices and outpatient facilities. The certificate program consists of 1,300 hours of instruction and prepares students to become Certified Medical Assistants after completing the program. Besides proffering the Certified Medical Assistant (CMA) designation, the AAMA also provides resources to students to help study for the CMA exam and ways to advance their professional career. The AMT offers one of the most popular medical assistant certification with the Registered Medical Assistant (RMA). An affiliate of the AAMA, the Florida Society of Medical Assistants works to raise awareness of the medical assisting profession and improve its standing within the healthcare profession. Florida's laws explicitly define what a medical assistant is, as well as outline the scope of a medical assistant's duties.